American Hazelnut Tree or Filbert Tree grows as a strong multi-stemmed shrub with desirable, edible nuts maturing in September to October. The American Hazelnut is also planted by wildlife enthusiasts to attract turkey and keep them and other wildlife in an area. Plant in full sun for best growth and development, though it can grow in partial shade, the plant's density and fruit production are generally reduced. A native plant variety, Corylus americana are medium to fast growers that sucker moderately, eventually producing a multi-stemmed, clump appearance growing to a height of 8 to 12 feet and with a crown spread of 10 to 15 feet. 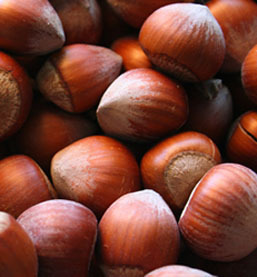 The nuts produced by American Hazelnut are a preferred by squirrels, deer, turkey, woodpeckers, pheasants and other animals. The male catkins are a food staple of ruffed grouse throughout the winter. They are also grown for use in cakes, cookies, and candies. American Filberts have low water requirements and shows a high tolerance to salt and alkali soils. This species adapts well to a range of soil pH and types, but performs best in well drained loamy soil. Please note: Cannot ship to AZ, CA, OR or WA.